Don Drysdale was an imposing figure on the mound who starred for the Dodgers in Brooklyn and Los Angeles. His 14-year career traversed both coasts, but stopped in Cooperstown, New York in 1984, when the right-handed hurler was inducted into the Baseball Hall of Fame. This top list showcases the best cards from Drysdale's dominating career and into his retirement years where he has remained a popular figure within the hobby. 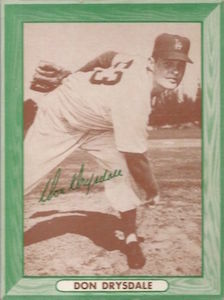 Shop for Professionally Graded Don Drysdale Cards on eBay. "Big D" made his MLB debut during the 1956 season, splitting time between the Brooklyn Dodgers bullpen and starting rotation. 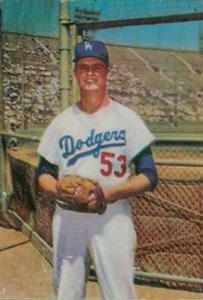 The rest of his career was spent in the starting rotation where he compiled more than 200 wins and nearly 2,500 strikeouts, and led the Dodgers to World Series titles in 1959, 1963, and 1965. The peak of his career took place in 1962 when he won 25 games, struck out 232 batters, and took home the National League Cy Young Award. 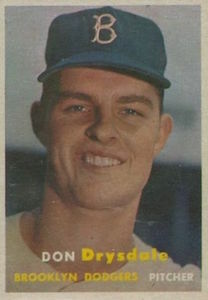 The first Don Drysdale baseball card is found in the 1957 Topps set. Stacked with talent, the 1950s Dodgers team sets offers collectors the opportunity to own cards of great players such as Roy Campanella, Duke Snider, and later Sandy Koufax. The latter paired with Drysdale to form a great pitching duo on the field, but collectors also took delight in tracking down the cards of the best left-right pitching tandem in the game. Still a popular figure with collectors who seek out cards from his playing days, Don Drysdale is also featured in modern sets. 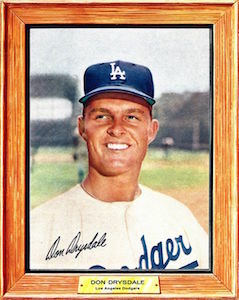 Vintage collectors are particularly keen on Drysdale cards, as many have been included in some of the best Topps Baseball sets from the era, and he was a part of some impressive Dodgers teams. Focusing on the key Don Drysdale cards based on a combination of value and hobby relevance, the following top ten list looks at the best cards from one of the most successful pitchers of the 1960s. Fleer made some great team-themed relic sets in the early 2000s, including the Dodger Blues relics which were inserted into packs of the 2001 Greats of the Game product. 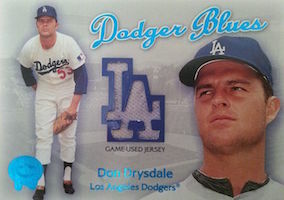 Drysdale has other memorabilia cards, but this is one is one of his more popular options with collectors. The card is well designed and hails from one of the top product lines from that era of baseball cards. 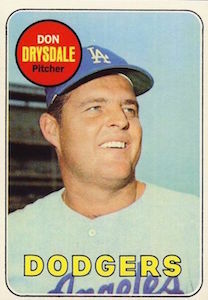 The 1969 Topps set marked the end of Drysdale career and his last appearance in a Topps product as an active player. Drysdale's last card is not only a popular choice with collectors, but is also one of the more affordable options. He also makes an appearance on a checklist in the set. Morrell Meats made several sets during the late 1950s, and early 1960s, with the 1959 set often being hailed as the best. The 1959 set does feature a Drysdale, but the card is incredibly difficult to find. The 1960 Morrell Meats set is easier to come across, but there are challenges with this product too. Namely, the cards came with a glossy finish that caused the cards to chip and flake. The condition sensitivity of this product has made it extremely popular with graded card collectors. Post started using the backs of their cereal boxes for cards starting in 1960. The Post Grape Nuts Flakes cards were oversized - measuring 7" x 8 3/4" - and almost covered the entire back of the box. The cards featured a variety of different athletes from baseball, football, and basketball. The initial group of cards issued in 1960 included a card of Drysdale who appeared alongside Mickey Mantle, Al Kaline, Eddie Matthews, and Harmon Killebrew. Collectors can find copies of this card attached to the Grape Nuts Flakes boxes, but often they were hand cut along the frame, making them highly susceptible to imperfections. Topps made some outstanding combination cards during the 1960s. 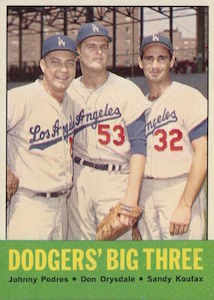 This 1963 Topps "combo" card features three of the Dodgers' starters from their three World Championship teams starting in 1959. Drysdale and Koufax appeared on several cards together over the years, but this card was the only one produced with all three pitchers from the 1959, 1963, and 1965 World Series Champions. The Bell Brand cards were inserted into bags of potato chips to celebrate the Dodgers relocation from Brooklyn to Los Angeles. The cards could be found in cellophane packaging inside the product and copies from the ten-card set can be still be found in their original packaging. The 3" x 4" cards had sepia photos and a green border. This set was amongst the first Los Angeles Dodgers baseball products, which has made these cards extremely popular with collectors. The 1964 Topps Stand Ups cards have always been a favorite with vintage collectors. The green and yellow background on the cards makes them very distinct. The 77-card product was sold in penny and nickel packs, which made assembling the set a little bit easier than the standard Topps set. Featuring a die-cut design, the player's picture could be folded over to create a stand-up card. As one of the 22 short printed cards, the Drysdale card has added to its value beyond the normal condition issues that come with the Stand Up cards. Nabisco offered collectors a chance at several Hall of Fame autographs during the summer of 1993. A few box tops and $5 gave you a chance to buy an autograph from Brooks Robinson, Willie Stargell, Ernie Banks, Catfish Hunter, and Drysdale. 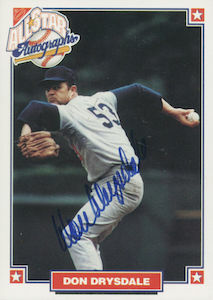 This card remains Drysdale's only certified autograph. Sadly, the Hall of Fame pitcher died of a heart attack the follow year, but not before signing thousands of these cards. Collectors took up Nabisco on their autograph deal, making the set one of the most affordable autograph sets around. The fact that the set is made up entirely of Hall of Famers has made it even more popular over the years. 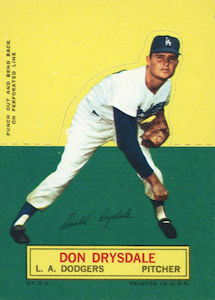 This second-year card of Drysdale is one of his most popular cards. The 1958 Topps set has long been a favorite with collectors, but has a special place with Dodgers fans since it is the first Topps set the card giant made after the team moved to Los Angeles. While several of the cards in this set feature variations, the Drysdale cards all have a yellow background with red letters. His card often has centering issues and is popular with graded card enthusiasts. The 1957 Topps Drysdale rookie card is considered one of the best cards from the late 1950s. 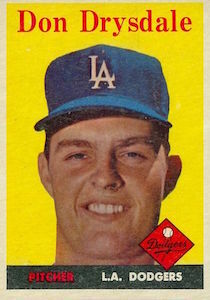 The portrait-style card was Drysdale's only Topps offering as a member of the Brooklyn Dodgers. Raw and graded copies of this card have long been in-demand with collectors and the 1957 rookie is a must-have for both Dodgers and Drysdale fans. 1967 Topps Don Drysdale – #55 PSA 8.5! Dodgers! Hall-of-Famer! I have my baseball cards from childhood. There are 98, 26 are duplicates. They are all from the 1950s. They include Hank Aaron, Willie Mays and Don Drysdale among others. They are all in excellent condition, like new. I want to sell them but not sure how to value them. I received an offer for $75 which quickly went to $150 when he found out what I have. Any advice? Great article Eric. That ’58 Topps is my favorite card of him despite it only being his 2nd year as opposed to his rookie. Dodgers baseball cards are fun to collect. I’m a sucker for anything nicely centered with good eye-appeal. DON DRYSDALE 2008 SP LEGENDARY CUTS AUTOGRAPH CUT AUTO # 2 7 Limited! !